Daily commutes should count as part of the working day because most of us spend the time catching up on work emails, scientists say. Improved wireless internet connections on trains and advances to portable devices like laptops, smartphones and tablets mean our working hours have extended into our travels to and from the office, experts say. Scientists found more than half of train commuters use the free Wi-Fi to send work emails – a habit they argue threatens to disrupt people's work-life balance. Researchers at the University of West England surveyed 5,000 train passengers commuting on the London to Birmingham and London to Aylesbury routes. The survey was carried out over a 40-week period during which time Wi-Fi access on the two services was incrementally improved by train operators. The team found that as the Wi-Fi access improved, it had the effect of extending working hours through the laptops and smartphones carried by commuters. 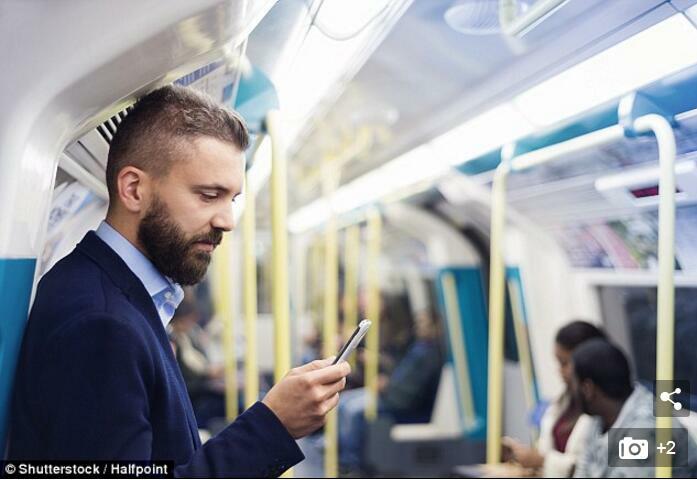 Over half (54 percent) of those surveyed using the Wi-Fi aboard the train were sending work emails. This figure jumped to 60 percent when faster Wi-Fi speeds were offered by the train operator. According to the researchers, others used their 3G or 4G mobile data connections for the task. Interviews with commuters by the researchers revealed that internet access was as important for commuters as it was for business travellers. Many respondents expressed how they consider their commute as time to 'catch up' with work, before or after their traditional working day. This transitional time also enabled people to 'switch roles', for example from being a parent to an office worker. Other commuters liked the 'buffer' of being able to work when travelling. Study co-author Dr Juliet Jain said mobile email access had caused a 'blurring of boundaries' between work and home life – and this now applied to commutes. 'How do we count that time? Do workplace cultures need to change?' she asked. 'There's a real challenge in deciding what constitutes work,' Dr Jain told a conference at the Royal Geographical Society in London. Counting the journey as work could allow for more staggered commuter travel times, which would 'ease commuter pressure on peak hours' travel, she said. But the change would mean employers would want 'more surveillance and accountability' for how employees were spending their commutes, she added.